The CD74HC4067 is a 16-Channel Analog Multiplexer/Demultiplexer. 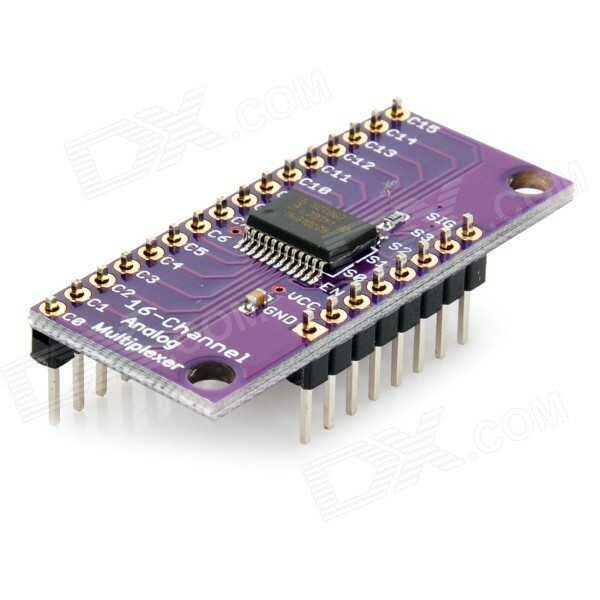 Description: This is a breakout board for the very handy 16-Channel Analog / Digital Multiplexer / Demultiplexer CD74HC4067. This chip is like a rotary switch - it internally routes the common pin (COM in the schematic, SIG on the board) to one of 16 channel pins (CHANxx). It works with both digital and analog signals (the voltage can’t be higher than VCC), and the connections function in either direction. To control it, connect 4 digital outputs to the chip’s address select pins (S0-S3), and send it the binary address of the channel you want (see the datasheet for details). This allows you to connect up to 16 sensors to your system using only 5 pins! Since the mux/demux also works with digital signals, you can use it to pipe TTL-level serial data to or from multiple devices. For example, you could use it to connect the TX pins of 16 devices to one RX pin on your microcontroller. You can then select any one of those 16 devices to listen to. If you want two-way communications, you can add a second board to route your microcontroller’s TX line to 16 device’s RX lines. By using multiple boards, you can create similar arrangements for I2C, SPI, etc. A multiplexer of this sort really just acts as a 16 to one 1 switch. The 4 digital pins are used to set HIGH or LOW, in a binary fashion (0-15) to determine what pin “SIG” is connected to. So bringing all 4 pins LOW would switch the CD74HC4067 to channel 0 (so SIG and C0 would be connected), bringing them all HIGH would switch it to 15 (so SIG and C15 would be connected). It is simple binary, but in the off chance you are one of the 99.8% of the world who doesn’t know binary, here is a simple table. Not just for reading The CD74HC4067 is capable of more than reading analog signals. It can be uses in either direction. So you could connect SIG to 5v, and then be able to switch the 5v to one of 16 channel pins if you needed to control 16 relays. It also works with serial. 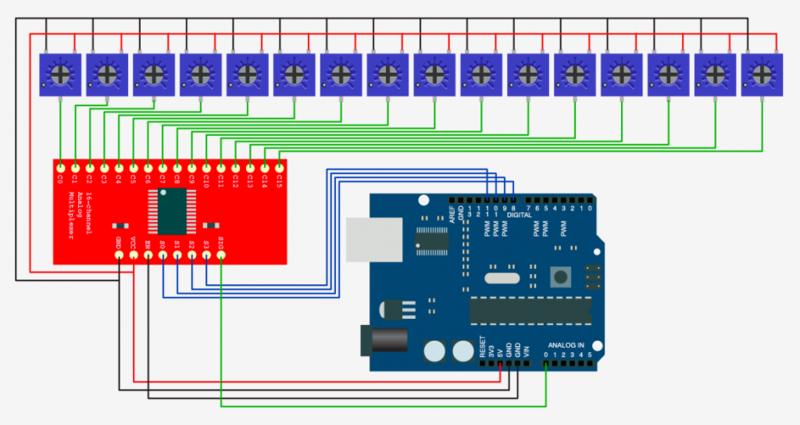 So… if you had 16 RFID readers that output serial, you could connect the SIG pin of the CD74HC4067 to digital 0 on the arduino (Serial RX pin) and the serial out of an RFID reader to one of the channels and be able to read from all 16 RFID readers.